Free upgrade to UPS or Priority / BRAND NEW / [clean wrapped, well protected] [Authentic edition exactly the same as the Official Listing] / Genuine US Bookstore! Get your book in perfect condition! We also ship international! PHILIP KOTLER is the S. C. Johnson & Son Distinguished Professor of International Marketing at the Kellogg Graduate School of Management, Northwestern University. He received his M.A. from the University of Chicago and his Ph.D. from the Massachusetts Institute of Technology. He is the author of over 20 books, including Principles of Marketing, Marketing: An Introduction, and Strategic Marketing for Nonprofit Organizations. He has contributed over 100 articles to leading journals, including Harvard Business Review, Sloan Management Review, Management Science, Journal of Marketing Research, and California Management Review. He is the only three-time winner of the Alpha Kappa Psi award for the best annual article published in the Journal of Marketing. Professor Kotler has also received the Paul D. Converse Award, Distinguished Marketing Educator Award, and Charles Coolidge Parlin Award. He has served as chair of the College of Marketing of The Institution of Management Sciences, a director of the American Marketing Association, and a trustee of the Marketing Science Institute. He has consulted for such major companies as AT&T, Bank of America, Ford, General Electric, and IBM. KEVIN LANE KELLER is the E. B. Osborn Professor of Marketing at the Tuck School of Business, Dartmouth College. He has degrees from Cornell, Carnegie-Mellon, and Duke universities. Previously, he was on the marketing faculty of the Graduate School of Business, Stanford University, the University of California at Berkeley, and the University of North Carolina at Chapel Hill. He was also Visiting Professor at Duke University and the Australian Graduate School of Management. His widely-cited research on branding has been published in the Journal of Marketing, Journal of Marketing Research, and Journal of Consumer Research. He has also served on the editorial boards of these journals and has received numerous research awards from his over 50 publications. He is author of Strategic Brand Management. He is also an academic trustee for the Marketing Science Institute. Professor Keller has consulted for such leading businesses as Accenture, American Express, Bank of America, Disney, Intel, Levi Strauss, Kodak, Shell, and Unilever. SWEE HOON ANG is an Associate Professor at the NUS Business School, National University of Singapore. She received her Ph.D. from the University of British Columbia. She was a Visiting Professor at the University of California, Berkeley, Helsinki School of Economics and Business Administration, and the China-Europe International Business School. She is also a co-author of Principles of Marketing: An Asian Perspective. In addition, she has written numerous articles for journals and conferences, including Journal of Advertising, Marketing Letters, Long Range Planning, Journal of Business Ethics, Psychology & Marketing, and Journal of Cross-Cultural Psychology. Her research and teaching interests are in Asian advertising and consumer behavior. She has consulted and conducted training for such companies as Glaxo-Wellcome Pharmaceuticals, Johnson & Johnson Medical, Caterpillar, and Wipro-Unza. SIEW MENG LEONG is a Professor at the NUS Business School, National University of Singapore. He received his MBA and Ph.D. from the University of Wisconsin, Madison. 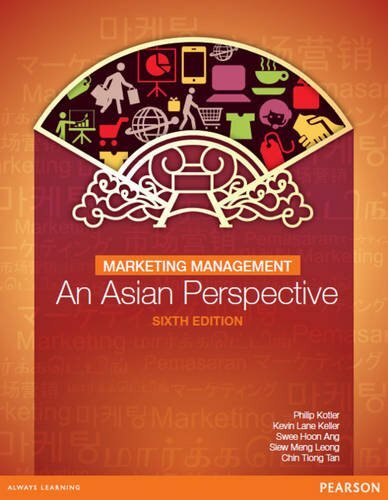 He is a co-author of Principles of Marketing: An Asian Perspective. He was awarded the Best Professor in Marketing Management by the CMO Council. He has published in Journal of Consumer Research, Journal of Marketing, Journal of Marketing Research, Journal of International Business Studies, Marketing Letters, and other international journals and conference proceedings. His research focuses on consumer behavior, sales management, and marketing research. Professor Leong is editor of the Asian Journal of Marketing, an advisory board member of Behavioral Marketing Abstracts, and an editorial board member of International Journal of Research in Marketing, Academy of Marketing Science Review, and Journal of Marketing Communications. He was an advisory council member of the Association for Consumer Research and served on the Academic Standards Council of u21 Pedagogica. He has consulted for such clients as Citibank, DuPont, Philips, and Singapore Pools. CHIN TIONG TAN is President of the Singapore Institute of Technology, a new initiative under the Ministry of Education, Singapore. He was the Founding Provost and Deputy President of the Singapore Management University. He received his Ph.D. from Pennsylvania State University. He has taught at the Helsinki School of Economics and Business Administration and the University of Witwatersrand, and was a Visiting Scholar at the Stanford Business School. He has published in Journal of Consumer Research, Journal of International Business Studies, Journal of Business and Industrial Marketing, International Marketing Review, European Journal of Marketing, and other international journals and conference proceedings. Professor Tan is also the co-author of New Asian Emperors: The Business Strategies of the Overseas Chinese, The Chinese Tao of Business: The Logic of Successful Business Strategy, and Strategic Marketing Cases for 21st Century Asia. He is on the board of Citibank Singapore Ltd, and is the non-executive chairman of Superior Multi-Packaging Ltd. Prof Tan is also independent director of several publicly listed companies. He is the Past President of the Marketing Institute of Singapore.